First time ever Garage48 created a hackathon targeted to people who need more help than usual. The Garage48 team was on a mission enabling possibilities for the disabled through innovation and a true lets-do-it spirit. 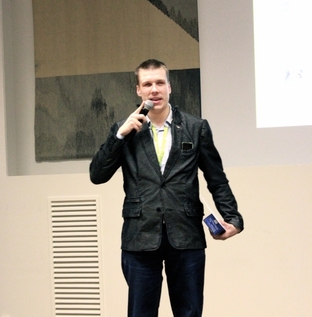 The event ended up being: "THE warmest and with endless positivity, that has been a very special experience even after my 20-event history at Garage48," said the organiser Maarika Susi. The event was organized by Garage48 Foundation and the Diversity Enriches Organization, in co-operation with Ministry of Social Affairs. The Garage48 Enable Tallinn 2014 event has made everyone more aware what does the definition of “a person with special needs or a disability” really mean – we found out that, as in most cases, the real disability lies in the attitude. Meaning, if you believe you can do something and are worthy then you are and if you think there are things stopping you – you might be right in some aspects, but most definitely there are ways to make great things happen! On last Friday of November the hall of TTÜ Tudengimaja gathered over 90 participants from over 10 different countries. The stage welcomed 25 different ideas about how to make the society better through innovation and technology. Though only 10 teams made the cut, the pitched ideas were so brilliant that the Garage48 team cannot still get some of the ideas out of their system. So we passionately encourage the participants to try again next year! The hackathon was as intense still as usual! After some sweat, sleepless nights, tears, laughter, coding, mapping, pivoting, eating, googling, constructing and wanting to quit... but didn’t, the teams managed to develop 10 working prototypes by Sunday evening. The presentations were all amazing – 3 teams even delivered hardware technologies! Making it even harder to pick the winners the decisions had to be done. The Mentors evaluated the technical endurance and the overall package. Though we can't give prizes to every team (although everyone should know that all the participants are winners), our Mentor Nicola Richardson pointed out her belief in the staying-power of the teams: "I think every project was worthwhile and every project has future. Everyone highlighted the issues that the disabled community face in Estonia and I am very confident that these projects will pass from today forward. They all have the potential to carry on tomorrow and they have obvious passion to continue and I look forward to seeing how they develop. Everyone who didn’t win deserve a recognition that they started something great!" Assistive Technology Assessment Tool is the world's first interactive tool that the therapists and doctors have been asking for! In this tool you can map the disability of your patient by only mouse clicks, find the necessary assistive product (e.g. wheelchair) and measure the impact of it on the patient's life. It is based on two internationally used classifications so it can be used in Estonia and worldwide! Team members: Margus Pärt, Mari Rull, Minna Sild, Toomas Urbanik, Mariliis Tilk, Tiina Kalevik and Ert Soasepp. it´s never been easier to give and get help. Helpific is a person to person platform to create stronger communities. Our idea is very simple, it comes from our natural instinct: to take and to give good will and various types of collaboration through connection. Helpific platform aims to make daily activities easier for its users. How?! By putting together the individuals who need a favor and the ones who can do a favor. It allows you to skip the long process of having to go through various entities to find another human being that is willing to do something for someone else. Helpific has a great potential for changing the human interaction through web platforms: it doesn't just exchange ideas and words, but it enables the direct exchange of needs and deeds. Let's Helpific the world around us! Team members: Annika Amenberg, Keiu Roosimägi, Kristjan Siimson, Marlen Ulrika Elisabet Kakkori, Peeter Karjus, Risto Novik, Sergei Beregov, Triin Üksvärav, Zsolt Bugarszki, Lana Kaplanovic, Tom Rüütel, Sven-Sten Kloren and Jüri Lehtmets. Friendly, intuitive mobile applications for disabled people with disabilities. Application helps to find specific information about new places, to read comments from other people with same types of disabilities and to share own personal experience. Also people can find the nearest places, such as medical centres, inva-WCs, hotels, restaurants and other venues. The feedback from disabled people can provide a good information to venues, how to improve their areas and attract new customers and develop society. Team members: Aleksandr Chatski, Dmitry Preobrazhenskiy, Hendrik Heinsoo, Jevgeni Striganov, Jüri Lehtmets and Tarmo Annus. Developing a unique mobile platform application that will help people with autism better understand and connect to the world around them. Team members: Adalbert Lucian Banyai, Eeva Koplimets, Ileana Ionescu, Rene Mesikäpp and Timo Petmanson. We are doing that VT-teenus app. It is nesseccary, because simple, fast and accurate ordering for deaf and too hearing. Only Android. Team members: Johannes Tamm, Martin Betlem, Siim Kaunissaare.Extra Leg designs home automation devices for visually impaired people. By connecting to pre-existing sensors, our device gives users relevant information about their home and the status of its security. In this way users can take action over things that otherwise would be complicated for them to notice. We will make guitarists life much easier. Instead of doing acrobatics on stage guitarists can now focus on playing like Jimi Henrix or Slash. We offer them Device which we will add to existing effects park and just one click of a button they can get the sound that they tuned out before performance. Team members: Juho Polukainen, Jüri Bogatkin, Jüri Oleitsuk, Karl Uibo, Kristjan Lužkov, Sven Kautlenbach Get Brailling is a keyboard replacement using Braille which enables ergonomic text entry, and can be attached by USB to the back of your mobile device. It offers you an tangible interface to your smart device. It is especially helpful for individuals with visual impairment wanting an alternative to their touch screen. Brailling is fun, innovative and educational. Get in touch, and get Brailling. Enabled WEB is an online tool for checking and monitoring website accessibility. People with disabilities can leave site-specific comments and discuss those issues with site owners and developers. Our goal is to raise awareness about web accessibility, provide feedback from users with disabilities, but also to highlight excellent sites and major mistakes. Disabled people have often troubles finding designated parking lots. Firstly, because information is poorly available about their location, and secondly, because as it often happens, someone for whom this space is not meant has parked there instead. Enablefy raises awareness about parking needs of the disabled and provides information about accessible parking. Huge thanks to Astangu Vocational Rehabilitation Centre who helped to organize the event, gave advice and also helped with the catering. Special THANK YOU to MindMedia who were behind the cameras at the Final event to make the live stream happen, to the British Embassy of Tallinn, Microsoft and to all our amazing volunteers! We couldn’t have done this without you! Rock on! And a big THANK YOU goes to TTÜ Tudengimaja for the cozy venue and for having us!